The movement to add Social Host Laws (SHLs) to the legislative mix is based on the assertion that we still have a long way to go to prevent kids from drinking. 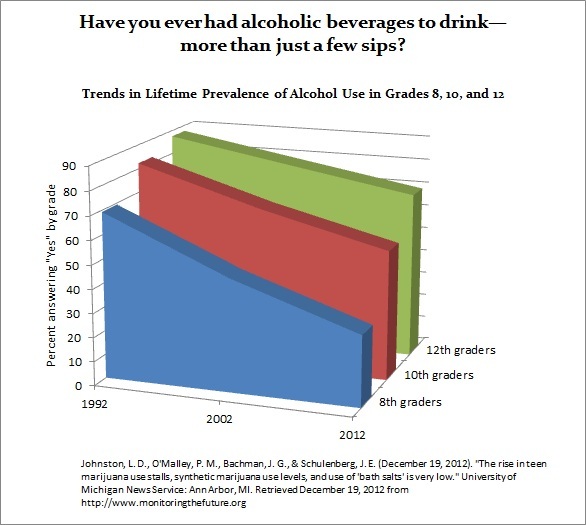 Yet, across the board, major government, university and national statistics show that alcohol use and binge drinking among high school students has declined steadily over the past three decades, and continues to decline annually. There are competing theories for the apparent success, with early education, community involvement, improved bar and restaurant compliance and law enforcement all contributing their bit. We should celebrate (substance-free of course) the efforts of lawmakers, police and community groups. If things are so rosy, why then are we creating controversial new laws? Social Host Laws for responsible adults and tougher penalties for underage drinkers and hosts are spreading at a rapid rate in communities across the country. Thirty states have specific Social Host statutes in their criminal code. More include language in their criminal and civil codes that penalize homeowners and renters regardless of their lack of knowledge or presence. Studies into SHLs’ effectiveness have not demonstrated they work, possibly because there are so many versions and too many variables to test. Perhaps SHLs are being adopted because we haven’t seen the same dramatic impact on young people’s perceptions and attitudes as we’ve seen on behavior. Most teens disapprove of extreme drinking behaviors ­— like drinking every day or binge drinking on the weekends — but the majority of teens doesn’t see the harm in it. In other words, they don’t think “binging” is a good idea but they don’t believe it can really hurt them. However, I fear that many SHLs are based on misinformation and local law enforcement’s budgetary needs. “Misinformation” because many individuals and groups advocating for these new laws routinely use old statistics or static statistics with no trend data. It’s easy to become a Chicken Little when you don’t have access to all the facts. “Budgetary needs” because the fines collected go to your local sheriff or police. about myy problem. You’re incredible! Thank you! Excellent knowledge on the subject of this subject, thanks for sharing.